Well, friends, I am in Finland. Through the generosity and encouragement of so many, I am here at Arteles. I have dedicated a whole ‘nother blog to this adventure, one you can find here: My Month in Finland. That’s the blog for everyone, writer friends, friends, family, people that want to mock what I am doing up here “with three kids at home!”, new friends, and people who want to know more about Arteles through the power of google. But what am I doing here? Working isn’t a good enough answer, but I am certainly doing that, and will expound more on that later. I am on a trip of a lifetime, traveling by myself overseas and in countries where I know very few native words. I have more time to myself than I ever have had, ever. There has been some serious reflection on who I am and why I am here. (That’s the general “why was I born” here, not the “Finland” here.) All of this is a luxury few people ever have. I feel like I have a pressed the pause button on my real life in Wisconsin, something I’ve wanted (and perhaps needed) to do for some time. There has been a part of me missing for awhile. A crack in the foundation. A leak no one knows from whence it came. Have I tried filling this part up with drugs and alcohol? No. Smoking? No. Any addictive behaviors? Not at all. In fact, I’ve been trying to limp on, pretending it wasn’t there, thus further damaging things. It got bad for awhile. But I’m feeling quite whole again. One of my desks. 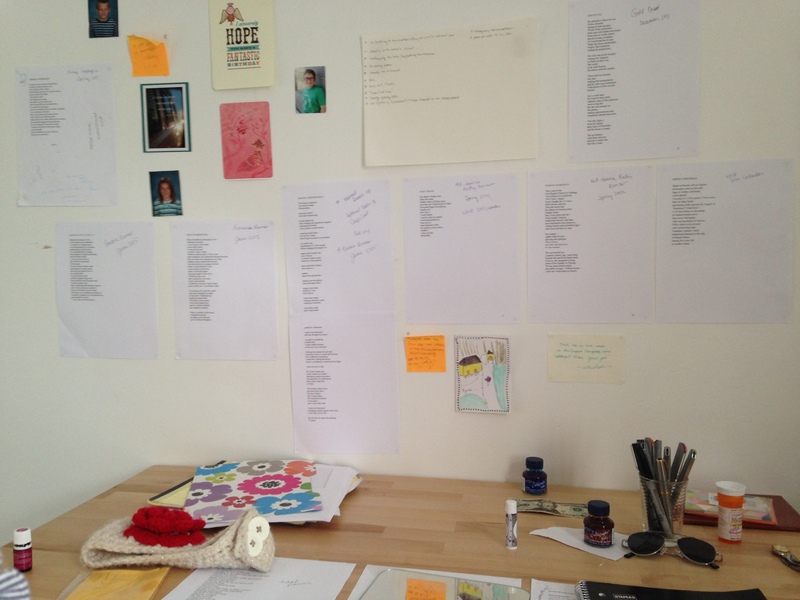 The wall behind it shows inspirational words, signs of home, and every poem I’ve ever had accepted. A very large part of my re-emergence into wholeness is getting off a medication I was on for a good part of 15 months. Prescribed to me to help some wicked PMS, it turns out that it was not the best thing going for me. When the prescription was upped, I went along with it, riding the waves of what was supposed to even me out. It didn’t, and to those of you who lived through my crazy effects, I applaud you and also apologize to you. It was messy. While the whole “getting off medication” thing is big, other parts are maybe more important. The time here at Arteles has given me a chance to do nothing. There are no permission slips to fill out, no breakfasts to pour, no answering the phone. I’ve been a wife for almost 14 years, and a mother for 12 1/2; this is a freeing feeling I haven’t had since my college days. I’ve been so busy taking care of others that maybe I forgot a little how to take care of myself. (Though I always *think* I’m taking care of myself, maybe I’m just kidding myself.) I can take a deep breath again here. I have had the chance to appreciate and even miss my life in the Not-tropolis. I miss my husband, something that desperately needed to happen. I miss my kids. From 5000 miles away, I’m able to appreciate the true miracles they are, whereas at home I’m embarrassed to say I get a little caught up in the fighting and responsibilities they bring. Now, as for the writing. Some people just don’t get it. Some people that I absolutely love and admire don’t get it. Some of the most intelligent people I know in real life just don’t get it. In a conversation with one such person, she said to me, “Well, I hope you get out of this what you need to. I mean, it’s not like a job or a work thing that you have to do.” I understand her point. I wasn’t in the mood to argue or for confrontation, but folks, this is my job. Writing is my job. Have I been paid for it? Not as much as I’d like, but I am working on the future paychecks. And even if I never earn one red cent from this, it will still be my job. It’s a contribution to the world, cheeky as that may sound. Know what else is a job I will never earn any money doing? Being a mother. Does that make my kids any less valuable? Any less a contribution to the world? No. I am pouring my life into both un-paid jobs. My time away will ensure I can do both a whole lot better. What have I written? A smattering of racy poems, some poems about nature (The Northern Lights? Partial Solar Eclipse? Hellloo…. ), a lot of edits and re-writes of poems I’ve needed to give attention to for awhile, and a really good one (I think) that I keep chipping away at. I’ve also had the time to submit things to places—a few poetry magazines, two really exclusive workshops, and I finally (finally!) sent out some queries and first chapters to actual agents. Gulp. While I’ve been here, I’ve also received emails about four poems accepted for publication. I’ve turned another year older since I’ve been here. Really. My birthday was a few days ago. A look in the mirror shows me that 36 is so far really awesome in that I now get pimples AND wrinkles. Aesthetics aside, coming here has been difficult and great at the same time, all in good ways. I am older, yes, but I feel I am wiser too. A funny note to end on: I didn’t hear from my children on my birthday. Except for Annie, who called me at 6 in the morning her time, in the dark, to yell at me that I was wrong about them going to a waterpark over the weekend. Even in the dark, I could make out the shadow of her hand on her little 7 year-old hip. Indignant FaceTimes from the home front!